Delta Airlines has announced that in order to cater for the peak summer season traffic to Dubai, it will be increasing frequencies on its popular Atlanta-Dubai route from 4 to 6 times a week effective May 23rd 08. All flights will be flown nonstop using a Boeing 777-200ER. It will revert back to the usual 4 times a week service from the second week of October. LHE - frequencies increased from 2 to 4 weekly flights using 2 weekly AB6s + weekly A 333 + weekly A 332. ISB - frequencies increased from 2 to 4 weekly flights using 2 weekly A 320s + 2 weekly A 333s. MXP - frequencies increased from 4 to 6 weekly flights using 4 weekly A 333s + 2 weekly A 332s. LOS - frequencies increased from 3 to 4 weekly flights eff March 30th using 3 weekly A 332s + weekly A 333. GVA/EWR - frequencies increased from 5 to 6 weekly flights using 2 weekly A 333s + 4 weekly A 332s. However, from the on set of the Winter 08-09 timetable, this route will be further increased to daily service. BEY - frequencies increased from daily to double daily i.e. 11 weekly A 321s + 2 weekly A 332s + weekly A 333. JNB - frequencies increased from 4 weekly to daily i.e. 3 weekly terminator flights + 4 weekly flights that continue onwards to CPT. IST - frequencies increased from 5 to 6 times a week. BAH - increased from 40 times a week to 6 times daily i.e. 42 weekly. 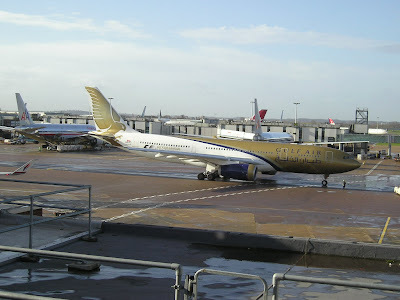 Gulf Air has officially confirmed signing an order for 16 Boeing 787s with Boeing on Friday in Washington DC. Whilst making the announcement, GF's CEO Mr Kooheji also revealed its wish to restart flights to 2 suspended destinations within a year's time i.e. DUB-Dublin and SIN-Singapore. Other announcements made were that the airline is keenly looking at the prospect of returning to USA and confirming the increase of summer seasonal flights to KUL-Kuala Lumpur from 4 weekly to daily between July 4th and September 13th 2008. Korean Air will be launching a new long haul route to Europe this summer with the addition of MUC-Munich to its ever expanding network. Three weekly nonstop flights using a B 772ER will be flown between ICN and MUC effective June 1st 08. Air France is increasing its frequencies to JED-Jeddah, Saudi Arabia from March 30th 08. The service will become a 5 weekly operation with all flights being flown nonstop using the A 319LR. Besides increasing JED, the French national airline is also increasing flights to Kinshasa, Congo to 4 times a week effective mid June. United Airlines will be upgrading capacity on its popular IAD-PEK route by replacing the daily nonstop B 772ER operated flight with the larger B 744 effective 14th March 08. Iberia of Spain has confirmed its earlier intentions of raising the number of weekly flights flown from its MAD hub to both BOS and IAD for the upcoming summer peak season. Flights to BOS, will rise from 4 to 6 times a week using an A 343 where as flights to IAD will increase from 3 to 5 times a week also using an A 343. Emirates has officially confirmed that it will be increasing its frequencies to MEL-Melbourne, Australia with the launch of a third daily flight effective February 2nd 2009. This new flight will be flown nonstop from its DXB hub using an A 345. The 2 daily flights are flown as one daily nonstop with an A 345 + one daily B 773A routed via SIN. Singapore Airlines has revealed that due to high load factors on its nonstop flights from SIN to EWR and LAX, it will be reconfiguring its 4 A 340-500s to an all business class layout seating 100 passengers. It will thus offer business class only flights on these 2 routes with EWR starting in June and LAX by Sept.
SAS has officially confirmed that it will be launching new flights to DEL-Delhi, India from the on set of the Winter 08-09 timetable with 3 weekly frequencies on offer from its CPH hub to DEL using an A 340-300. Service begins from Oct 27th 08. Japan Airlines has decided to upgrade capacity on its popular nonstop Tokyo-Delhi route by replacing the B 777-200ER with the larger Boeing 747-400. The main reason for this upgrade is due to JAL recording increasing load factors in its premium cabins on this sector. This change will come into effect from Aug 1st 08 and all daily flights will see nonstop B 744 service. Air China has reportedly being named the "unidentified" airline that has placed an order for 15 new Boeing 777-300ERs with Boeing few months ago. These new aircraft will be used in due course to fully replace CA's fleet of B 747s.